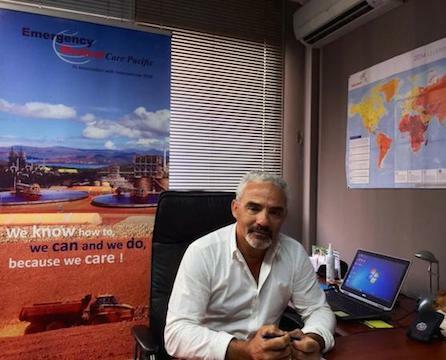 Emergency Medical Care Pacific, created in 2008, is a subsidiary company of the International SOS Group, world leader in Medical care assistance and international risk management for companies and international organisations. In term of experience, Emergency Medical Care Pacific (EMC Pacific) was selected in 2008 to supply and manage, the medical services of KNS (Koniambo Nickel SAS) near Kone in the North Province of New Caledonia as part of the construction of the pyrometallurgical complex of the Vavouto site. EMC Pacific ensures the site medicalization for 6000 employees but also the management of the visits in labour medicine in diverse country: China, Filipinos, India, Indonesia, Thailand. EMC Pacific also manages the medicalization of the Nickel plant based in the south of New Caledonia on behalf of VALE NC, and SLN society (ERAMET group). Our compagny has, also, create a partnership with the Ministary of Defence. - The implementation and management of the medical clinic. - Provide first aid in case of a work accident. - audit and formations (SST, First Aid...). All the staff recruited by EMC Pacific has to have a wide hospital experience, mainly within the emergency services to allow a post-hospital quality management. In terms of external continuing training, the doctors increase their knowledge through university or hospital programs such as: echography in emergency service, managing serious burn victims through first aid. Internal training within the teams is also provided through weekly "Tool-Box Talks" which includes numerous subjects (Manage through first aid wounded after an explosion, chemical burns, wounded prisoners, prevention against dengue and situation scenario). The teams have a wide life and work experience in difficult and isolated area acquired on the field but also with N.O.G ., even with the army. Medical and nursing staff activity is based on intervention protocols in adequacy with the site emergency and with the agreement of the labour doctor on site. EMC Pacific adapts himself to every specific risk met because their staff received a specialized training. For example, some doctors and nurses were trained at work, on plant sites with maritimes terminals of ore loading with deep underwater work. EMC Pacific maintains, on a long term, his medical teams on their respective locations to ensure a follow-up on medical operations and to maintain a field knowledge which is constantly updated. EMC Pacific guarantees to his customers an unequalled care quality level on-site, wherever the geographical location. The hygiene and quality policy is an essential factor of the development and the competitiveness of EMC Pacific. This quality attachment becomes a reality by normalizing and detailing procedures in the documents which EMC Pacific puts back to his customers. Furthermore, each collaborators on the field as well as in the back offices, are trained to contribute to the continuous improvement of the quality plan procedures. EMC Pacific wishes to be a partner which relieves his customers of all health constraints and allows them to focus on their job and their results. This skills set, combined to a rigorious ethics, makes EMC Pacific a credible company able to respond in a responsible and professional way all of the requirements of his customers. EMC Pacific has developed a strong corporate culture which arouses the loyalty of his collaborators through values who animates continually their profession.